In a rare instance of parody preceding real life, Mystic Pizza is getting turned into a musical, years after 30 Rock invented a musical version of the 1988 movie. 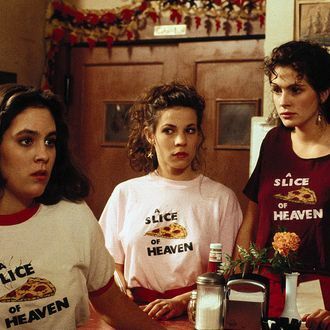 Today, producers Lively McCabe Entertainment announced the plans for the adaptation of Mystic Pizza, which was originally written by Amy Holden Jones. Melissa Etheridge, of all people, will be writing the songs, while Gordon Greenberg (Irving Berlin’s Holiday Inn) will direct and collaborate on the book with Sas Goldberg (best known as an actress in productions like Significant Other). Concord Theatricals will publish and license the musical, though it hasn’t yet announced the rest of its creative team, or specific plans for a run on Broadway, Off Broadway, or at a regional theater. The musical is just one of many big-name film-to-stage adaptations that are in development or have been produced recently, including a planned version of The Notebook with songs from Ingrid Michaelson; Pretty Woman, another Julia Roberts movie, with songs from Bryan Adams, which is currently in performances on Broadway; and upcoming versions of Tootsie and Beetlejuice. Somewhere, a heroic props supervisor is trying to figure out just how much pizza one person can eat per week onstage (32 pieces is too much! ).